In the previous session, the children defined their goal for their hotspot in the form of best case scenario. Now, they will think of ways to bridge the gap between the current and preferred scenario. Brainstorming as an activity allows children to unleash their creativity to generate innovative solutions for their opportunity of change. The students shout out ideas as they occur to them and build on the ideas raised by others. All ideas are noted down without criticism and only when the brainstorming is over, the ideas are evaluated. The session enables the students to voice their thoughts without a fear of judgement as there are no wrong and right answers. Doing the session in an open space could be great way to create an environment that enables sharing of ideas. To set a collaborative tone in the class, you can do the Yes/ And Activity. Refer to the video to know how to conduct the activity. Talking stick: Only the person with the stick gets to speak. This includes the instructor! Talking wad: Students choose who speaks next. It can be tossed around a group. Discussion tickets: Each student in the group has one or two discussion tickets. In order to add to the dialogue, every student who wants to speak must first "pay" for the privilege by giving up a ticket. This strategy ensures that even the shy students get a chance to speak. Brain writing: Each group is provided with a sheet of paper. After they have written one idea, they swap their sheet with another group. This is continued until the papers have passed around the class. This method allows students to build on other students’ ideas. Sticky notes: Each student within group writes their idea on post its which is stuck on chart paper/ board. This can then is organized into themes and reduce repetition. Card method: Each student in the group lists ideas on a card/sheet and pass it to their right. The student on the right adds to it and it is again passed around. If someone can’t add, they can add a clarifying question on the card. While sharing ideas, there should be only one conversation at a time. Remind the students to avoid conversation stoppers such as "That's a stupid idea," and "That will never work". Assign a student to take notes in the group. Encouraging the children to illustrate their solutions in the space provided in the book will lead them to have more clarity about their solution. 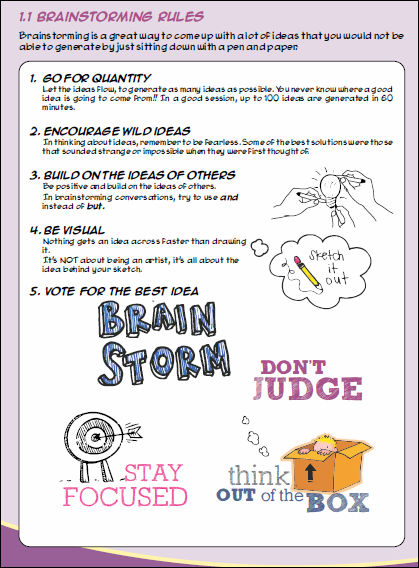 While voting for the final ideas, it will be a great strategy to encourage the students to collaborate and build a combination of the best ideas from each group. Post-its can be a great way to structure and organise all the ideas together. ​As you close the loop for the session, encourage the students to give positive feedback to the peers within their group who were actively collaborating and adding on to each other’s ideas.